Finding Eloquence: How Sad Do You Like Your Books? Spoiler Alert: Thorough spoilers from The Great Alone by Kristin Hannah are discussed herein. So this is partly a book review and partly a study of sorts on sad books. It begins with Sunday night of this week. 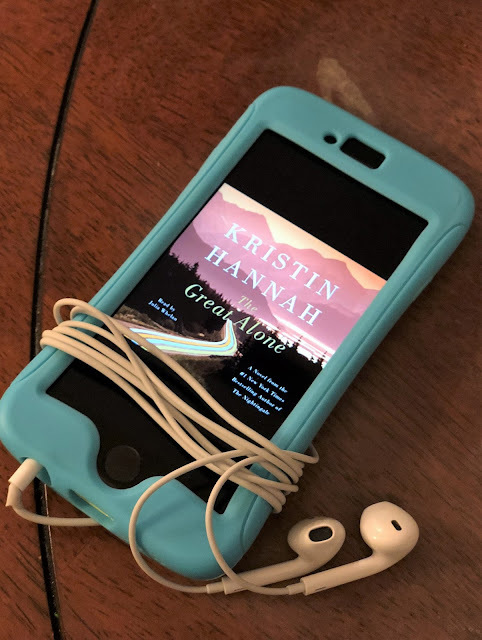 I laid awake that night for nearly four hours to finish listening to the audio version of The Great Alone by Kristin Hannah. It was one of those books that I just knew I HAD to finish because I wouldn’t think of anything else until I did. But, riveting and suspenseful as it was, as one horrific tragedy after another ensued, I sometimes found myself just wishing for the torment to be over. I was heaving ugly, guttural sobs throughout the audio equivalent of the last 50 pages or so, but at least tears of relief and gladness were mixed in by the very end. An end that finally brought some good after so much suffering. That said, The Great Alone got me thinking about sad books in general. How sad is too sad? Is a certain balance of happy and sad required? If an author’s going to pack a book full of pain and distress for the characters, is a satisfying ending always necessary in order to justify it all? When does the content become too difficult and too much? Each person obviously has different answers to these questions, and this book has helped me consider mine. I think this may be the first book (at least the first in a long time) that made me think, This might be too much. Please give it a rest, dear author. So, why did I feel that way? 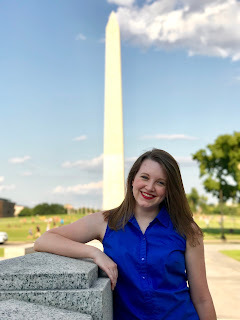 Here are my hunches (Disclaimer: these thoughts are limited to sad fiction books – a true story that’s sad but needs to be told is another thing entirely). This is probably the most important compensation for me (and I’m guessing for many of us!) when it comes to sad, difficult content in books. There are obviously many books which tackle grim subject matter, but do so because the author wants to explore it sympathetically. I knew this was the case with The Great Alone from the outset, so I was prepared for it to be challenging. The story opens on the Allbright family and their move to the wilds of Alaska, a place that they hope will be a fresh start. Thirteen-year-old Leni’s main concerns at the beginning are surviving “new girl” status at school, and of course whether this “next thing” will really help her parents. Ernt and Cora Allbright have tried many new things since Ernt returned from the Vietnam War, but Ernt still can’t hold a job, still drinks too much, and still acts out violently. As the family prepares for Alaska, none of them can predict how its terrible beauty will change them, for better and for worse. Domestic abuse, undiagnosed mental illness, and traumatized childhoods are central themes throughout this book, and the brutality of these problems is heightened by the rough, unforgiving Alaskan setting. For some, this is already too much. Many will know right off that they can’t handle a story whose plotlines turn on domestic abuse, mental illness, sexual abuse, severe trauma, or any number of other difficult topics. If that’s you, definitely feel no guilt in staying away from such books. In my case, these subjects are certainly hard to read about, but I still appreciate honest discussion of them through a story if it’s done thoughtfully. When I started The Great Alone, I was ready for that much, and I did fine with everything until the drama of the back half really took off. Leni’s relationship with Matthew Walker takes up more of center stage in the story’s second half, and their relentless trials saddened and wearied me. After their severely damaged childhoods, I struggled to see the point of the pain that Leni and Matthew continued enduring into adulthood. Their difficult early years developed their characters and drove the plot forward – two traumatized children found friendship and comfort from one another, and their backgrounds made them sure of what they wanted to change in their futures. As they grew older, they began to see how they could build that better future together, and it hurt to see them kept apart for so much longer than expected. The great conflict in the second half – Ernt’s climactic violence and Cora’s explosive act of protection when he hurts Leni – was definitely a necessary tie-up, but I can’t help wishing Leni and Matthew hadn’t paid such a heavy price in the process. Their accident while hiding in the mountains and subsequent years-long separation were the most difficult parts for me. I kept asking, Why? Why must they endure this too? Haven’t they been through enough? And I’m still not sure exactly what purpose was served. They had already grown up too quickly because of their terrible childhoods, so I didn’t quite see the need to permanently injure Matthew or to draw out their ability to be together for so long. 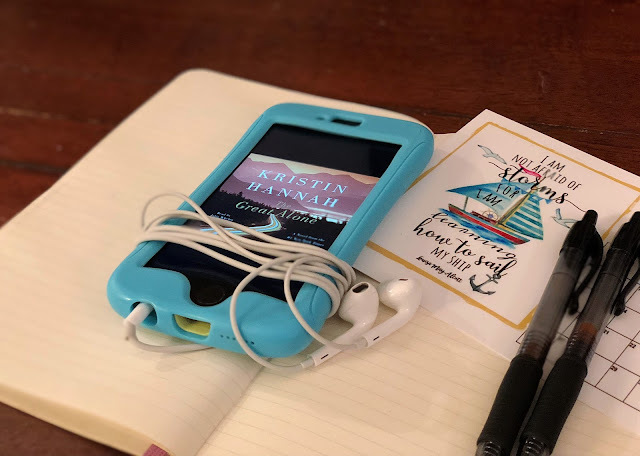 Not saying I have the perfect alternate ending in mind, but I kept thinking that Kristin Hannah could have surely thought of something! I've realized that this was perhaps what was most lacking in The Great Alone for me. Sadness, pain, and tragedy were so incessant for the latter part of the book that I felt like I was choking on it. Here’s a summary. Cora suffers the most brutal beating from Ernt yet. Matthew and Leni have their terrible mountainside accident that leaves Matthew brain-damaged. Leni discovers she’s pregnant while Matthew lies in a coma. Ernt begins to beat Leni when he finds out about the pregnancy, prompting Cora’s shocking act of protection. She kills him without even flinching, and then she and Leni cover the murder and flee Alaska. From there, years of living under false identities ensue. Cora holds onto terrible guilt for everything, even as she’s dying of lung cancer, which she’s convinced is her punishment. And her last wish is for Leni to turn in her confession to the murder so that Leni can live freely again. But even as Leni contemplates returning to Alaska at the end, there’s no guarantee Matthew will know her or be independently capable. Are you tired yet? I know I was. Thank goodness for MJ, Leni and Matthew’s little boy. He was definitely a bright spot that helped me to the end! As this tirade of tragedies progressed, I realized that I either needed more time between them or fewer of them. The mountain of pain I was trying to process for the characters was overwhelming and was growing faster than I could keep up with. Even when things calmed towards the end, I couldn’t stop thinking about how scarred Leni and Matthew would be for the rest of their lives. Leni had grown up under an abusive father and Matthew had endured his parents’ divorce and watched his mother fall through a treacherous frozen lake and die – why add brain damage, witnessing one parent kill the other, and years of isolation so soon after?! Granted, Ernt had definitely evolved into a full-out villain by the time Cora shot him, and the necessary irony of Cora and Leni becoming survivors of him was clear. But as I’ve mentioned, Leni and Matthew’s accident on the mountain and their years of separation were the most difficult things for me. When Leni first fell off the trail, I sighed thinking, Here we go again, I guess. Frustration only increased when Leni and Cora left Alaska before Matthew had healed much, and I stubbornly maintained that the accident and its consequences weren’t entirely necessary to the story. I think it would have been an improvement even if these storylines had just been toned down a bit – maybe something with an easier recovery than a brain injury for Matthew? A way for Leni and Cora to stay in Alaska or for Leni and Matthew to reunite earlier? Again, I’m no bestselling author, but surely there was a way! The Great Alone accomplished this well overall. Despite the ugly crying, I was also taking deep breaths of relief by the last twenty minutes. Leni returns to her beloved Alaska with her son. The truth about Ernt’s death becomes public and Leni can live as herself again with no more weighty secrets. She and Matthew are reunited. Matthew is permanently weakened and disfigured, but still loves her, loves their son immediately upon meeting him, and can walk and talk again. Their community pays touching tribute to Cora. And by the last page, we know Matthew and Leni have married and had two more children, they’ve made a life for themselves in Alaska, and Leni’s photography is reaching new heights. Glory be. I was ready for that happy ending, I assure you. But I persist in my wish that it hadn’t taken so long to get there. I also maintain uncertainty of how necessary Matthew’s lifelong physical impairments were. I was thankful he had regained mobility and independent thought and emotion, but he and Leni would have had plenty to work through already without those added burdens of physical limitations and the years apart. The other story arc that didn’t feel totally redeemed to me was that of Cora. She positively broke my heart. She’s an honest portrayal of a woman who can’t find the will to leave an abusive husband, which I understood. But it was gut-wrenching to see her inability to forgive herself at the end. She blamed herself for everything Leni had endured and staunchly believed that her lung cancer was divine payback. I cried so much and wanted to hug her and tell her how loved she was. The brightest note at her end was the hope she had for Leni’s future, but I just wish she had made peace with herself before her death. So, what are your thoughts on sad or heartbreaking books, or books that address difficult subjects? Do you need a balance of some sort? When do you know it’s too much? I’d love to hear your thoughts in comments. And if you’ve read The Great Alone, I’d love to hear other perspectives on it! I'm about two thirds of the way through the book. I got to the point where I said "Enough!" And Googled the plot synopsis. It's like none of the characters from her books can escape unscathed. I remembered the way that she killed a main character off just as she got home from a concentration camp. And I just couldn't anymore. TOO. MUCH. SUFFERING. I just did that now, and came across this page. And I 100% agree with you. It was definitely a lot! I'm glad I wasn't the only one who felt that way! Me too. I couldn't bear any more. Thank you for your post! I'm at the point where Matthew is in a coma and Lennie is driving her parents mad because she stopped talking to Ernt. I had to know if it gets better. Thanks for the head's up! I definitely needed to be prepared for the rest of the novel. Stumbled across this as I was trying to refresh my memory before i lead a book club about it tonight. These takes were so spot on. Sorry I missed your comment before now, Karen! But I'm so glad this post was of service to you and that you sympathized with my thoughts. I've still thought about The Great Alone often since I wrote this post and I still can't entirely get on board with how much suffering there was. I enjoyed it overall, but a little less tragedy would have served it well! This the fourth book I’ve read by Hannah. 3/4 used a coma as a key plot device. That reeks as a cheap soap opera plot device. To your overall point, I couldn’t agree with you more. Not because I dislike tragedy or unhappiness, but because all of the various plot twists distract from the more rewarding parts of the book. To me the first half was outstanding, a tale that takes place in Alaska but is really about the effects of Vietnam. It was like America trying to run from itself and keep its demons at bay, only to make them worse, compounding tragedies and traumas. But then the soap opera started and the story got cheap. Thank you for your comment, Robert! I'm glad it wasn't just me that felt this way -- I liked the ending, but I just felt it took way too long and was far too difficult of a road to get there. I think you're right when you say that it distracted from the better aspects of the book! I agree with everyone. Thank you for the detailed summary. I just joined a book club and didn't have time to read the whole book in advance. Although I really like Kristin Hannah, this may not be the one to stay up all night reading! Too sad for me. Glad to be of service, Virginia! It definitely might be a better idea to save this one for the daylight hours at the least! I just finished this book and was left feeling emotionally drained, and couldn't quite pin what felt off about the book to me. That lead me to googling "Leni and Matthew" to see others feeling about this book. I really enjoyed it from beginning to end, but it felt like so much of the first half of this book was a big lead up of largely repetitive events all to have Matthew get injured, Ernt killed, hiding a body, running away, reunions with parents, pregnancy and birth then cora dying all within the last few chapters! I was a crying mess and stayed up way too late reading it last night. I was happy Matthew and Leni at least ended up together, but holy cow! Did we need to endure all of that in the last small portion of the book?! I loved it, but that last part could have been a whole book! Agreed! The last quarter of the book was practically another book in itself! I was overall okay with the ending, but I agree that it was too much to endure within too few pages.